15 Commercial Real Estate & Properties in Carina are listed in 4 categories. We have 9 Retail ShopsLease , 3 Medical and Consulting PropertiesLease , 2 OfficesLease and 2 Other Commercial PropertiesLease . 69m2 or 114m2 Retail/Food/Medical space in the highly exposed Carina North shopping centre. Grease trap connection available. Ample on site car parking. Signage and exposure opportunities to Stanley Road. Versatile tenancies suitable for a variety of operators including Hairdresser/Barber, Beauty Salon, Sushi Shop or Allied Health. Join existing tenants Foodworks, Megafresh Fruit & Veg Barn, McGuires Cellars, Cafe and other food services. Incentives on offer for the right tenant. For further information or to book an inspection please contact your Blocksidge Real Estate Agents James Ovenden on 0404 191 537 or Alan Simms on 0407 257 862. 45m2, 69m2 or combination of 114m2 Retail/Food/Medical space in the highly exposed Carina North shopping centre. Grease trap connection available Ample on site car parking. Signage and exposure opportunities to Stanley Road. Versatile tenancies suitable for a variety of operators including Hairdresser/Barber, Beauty Salon, Sushi Shop or Allied Health. Join existing tenants Foodworks, Megafresh Fruit & Veg Barn, McGuires Cellars, Cafe and other food services. Incentives on offer for the right tenant For further information or to book an inspection please contact your Blocksidge Real Estate Agents today. Prime main road frontage off Old Cleveland Road Area of approx 70m2 available Fully fitted with consulting rooms and reception area Plumbing and sink in rooms Convenient retail strip with complimentary businesses surrounding Ample parking off street and onsite Signage area provided to showcase Available immediately Contact Marketing Agent today Carina is located 7 kilometres east of the CBD and is a mainly residential suburb bordering Carindale, Carina Heights, Cannon Hill and Camp Hill. Multiple businesses are located along Old Cleveland Road, which is a busy arterial road servicing the eastern suburbs. Spectacular landmark position in Carina Areas of 45m2 or 90m2 available Prime main road frontage and exposure Landlord seeking food & cafe and medical users Equipped with plumbing services on premises Parking onsite & off street parking for convenience Motivated landlord Inspect today with Marketing Agent Carina is located 7 kilometres east of the CBD and is a mainly residential suburb bordering Carindale, Carina Heights, Cannon Hill and Camp Hill. Multiple businesses are located along Old Cleveland Road, which is a busy arterial road servicing the eastern suburbs. 73sqm office / medical consult space 40sqm storage / garage below Current layout of 3 partitioned offices, reception and waiting area Own toilet and kitchenette in tenancy Great signage and exposure opportunities to busy Old Cleveland Road, Carina 3 on site car parks and ample street parking $30,000 p.a Gross + GST (outgoings included) approx For further information or to arrange an inspection contact Ray White Commercial TradeCoast marketing agents Jonathon Jones Jay Jones. 62sqm Retail / Medical / Office space Current layout consists of large open plan main area, partitioned office and kitchenette with shared toilets at the rear of the complex 2 Exclusive use parking spaces at the rear Signage and Exposure opportunities to busy Old Cleveland Road Great public transport access with a bus stop situated directly out the front Available beginning of May 2018 Join other tenants such as Evolve mindfulness clinic, Remax real estate, GG Hair and more approx LEASE PRICE: $34,100 p.a Gross + GST (outgoings included) For further information or to arrange an inspection please contact the Ray White Commercial TradeCoast exclusive marketing agents Jonathon Jones Jay Jones. 47 105sqm retail / medical / office space Existing layout consists of reception/waiting area, communal open plan work area, 4 consult rooms/offices, kitchenette, laundry room and storage area Can be split into 2 tenancies of 58sqm 47sqm respectively 2 glass shop fronts already in place Ample on site parking Available April 2018 Signage and exposure opportunities to busy Old Cleveland Road approx LEASE PRICE: $28,200 $60,375 p.a Gross + GST For further information or to arrange an inspection contact your Ray White Commercial TradeCoast agents today. 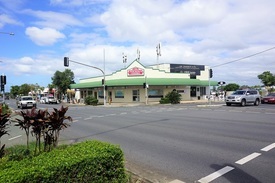 Areas available 45m2, 69m2 or combine for 114m2 Best exposure on main road, with ease of access Join Foodworks, Megafresh Fruit & Veg Barn, Cafe, BBQ Chicken and other food services Exceptional parking available onsite Expand your business horizon & watch its growth Inspect today with Exclusive Marketing Agent Carina is a suburb of Brisbane. It is located 7 kilometres east of the CBD, and borders Carindale, Carina Heights, Cannon Hill and Camp Hill. Carina is a mostly residential suburb and a perfect place to open a retail food outlet. Carina Medical Suite - Excellent Location $58,000 pa + Outgoings + ..
115sqm Medical Suite/Office in Carina Gardens centre Current floor plan consists of 3 partitioned consult rooms, minor treatments room, reception / waiting area, staff office, kitchenette and its own bathroom Great location on Old Cleveland Road providing excellent signage and exposure opportunities Join other medical tenants Carina Gardens Dental and Speech Care. 2 Exclusive use car parks for business owners/directors and remaining parking for clients Approx. $58,000p.a. + Outgoings + GST For more information or to arrange an inspection contact the Ray White Commercial TradeCoast marketing agents. 115sqm medical / retail tenancy Freshly refurbished open plan layout with polished timber floors throughout, new ceiling and paint Own kitchenette and toilet Large glass shopfront ideal for signage opportunities Versatile tenancy that would suit a wide variety of operators and businesses. Join neighbouring tenants Pump Espresso, Snap Fitness, QML Pathology, Jenny Craig, Oz Radiology and Medical Centre. Approx. $74,750p.a. Gross + GST For more information or to arrange an inspection please contact exclusive marketing agent Jonathon Jones. 73m2 Food preparation/ Cold room facility in Kenrose Street, Carina. 14m2 Cold Room included Non slip flooring throughout Stainless Steel Sinks/Bench tops Ample on site and street parking available Both front and rear access to the tenancy Call for an inspection today! With unbeatable street exposure along Brisbane's bustling Old Cleveland Road arterial, this 69m2 ground floor commercial space within the highly sought after Carina precinct is a truly rare find. Suited to retail, office and medical usage alike, the fully air conditioned and partitioned interior boasts sinks within each office (a particularly valuable asset for prospective medical tenants) as well as exclusive use of toilet facilities. The site also offers two exclusive use car parks, as well as brilliant signage opportunities on one of Brisbane's busiest roadways. Call now to arrange an inspection of this rarely available commercial opportunity. This steel framed, AV Jennings built home is only 7 years old and has had only one owner! They have purchased their new property and need this home sold so they can move on.Low maintenance living coupled with all of the modern conveniences we expect from homes of today, this freestanding home has been cleverly designed to maximise the space whilst maintaining privacy. Situated on 322m2 in the master planned Stellar Estate, this home is only 2kms from Westfield Carindale and the upcoming East Village development and a short stroll to the newly announced Cannon Hill Community Links, an 18 hole public golf course. With a 7Eleven open 24 hours around the corner, doctors surgery across the road and a myriad of bus routes along Creek Road, you will have everything right at your doorstep. Most homes in the estate are owner occupied, with private roads and well maintained streetscape ensuring that this neighbourhood is well sought after. Downstairs Air conditioned, King sized Master bedroom Walk in Robe and #x26; large ensuite with double vanity Air conditioned, open plan living and dining room Family sized kitchen with natural gas stove and 900mm oven Powder room for guests Covered entertaining area opening out grassed lawn and paved alfresco Large laundry with loads of bench space Double car, remote lock up garage with internal access Storage cupboards Security screens on all window and doorsUpstairs Three oversized bedrooms all with ceiling fans and plenty of natural light Large, air conditioned second living room Family sized bathroom with separate bath and shower Separate toilet Tinted windows to keep the house comfortable and cosyThis home will not last long, free up your weekends and call us to inspect this home today! Situated in the heart of Carina is this generously proportioned, ground floor apartment that is further enhanced by a quiet neighbourhood location and within easy access to nearby cafes, shops, transport and all conveniences. It features a great layout that offers good sized interiors and private outdoor space.Positioned within a small complex with a large living/dining means friends and family are not forgotten here with plenty of room to entertain and relax. You won and #x27;t be short of cupboard and bench space in the roomy and functional kitchen which serves as the hub of the home.Both bedrooms are located at either end and are separated by a large bathroom and internal laundry, while the master features two way access to the bathroom. Property Features:2 bedrooms with wardrobesEnsuite to masterDishwasherSecurity screensBrand new timber floorsSeparate bath tub and #x26; internal laundry Remote control single garageSorry no pets.Be spoiled for choice with some of Brisbane and #x27;s best cafes, restaurants, delis and espresso bars nearby. Fast city buses stop at the end of the street, with easy access to the Gateway Motorway north and south.PLEASE NOTE:You must read the terms of the Tenancy Agreement prior to applying for the property. A copy is available at our office, and at inspections. We recommend you call our office prior to the inspection to confirm the appointment time as the property may be rented. Each property is open for approx. 10 minutes only, if a property has been leased a leasing consultant will not be attending.